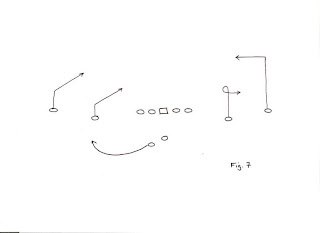 We're probably all familiar with using a passing tree to describe the routes to be run on a given play. Often, in the spread offense, numbers aren't enough. An example of this would be if you wanted to run a follow pattern, in which the inside receiver runs a short in and the outside receiver runs a deep in; how would this differ from a follow switch pattern, in which the inside receiver runs the dig, and the outside receiver comes underneath on an in ... say your "4" pattern is a down-and-in route -- is a "44" a Follow or a Follow Switch? Is a 4 route a drag, dig, or square in?